Their chorus: I’m okay with math, except word problems. They treated “word problems” as some exotic and poisonous breed. These had nothing to do with the main thrust of mathematics, which was apparently to chug through computations and arrive at clean numerical solutions. I was mystified—which is to say, clueless. Why all this word-problem hatred? To me, the very phrase “word problems” sounds bizarre. It’s like “food meals” or “page novels.” Of course meals have food. Of course novels have pages. 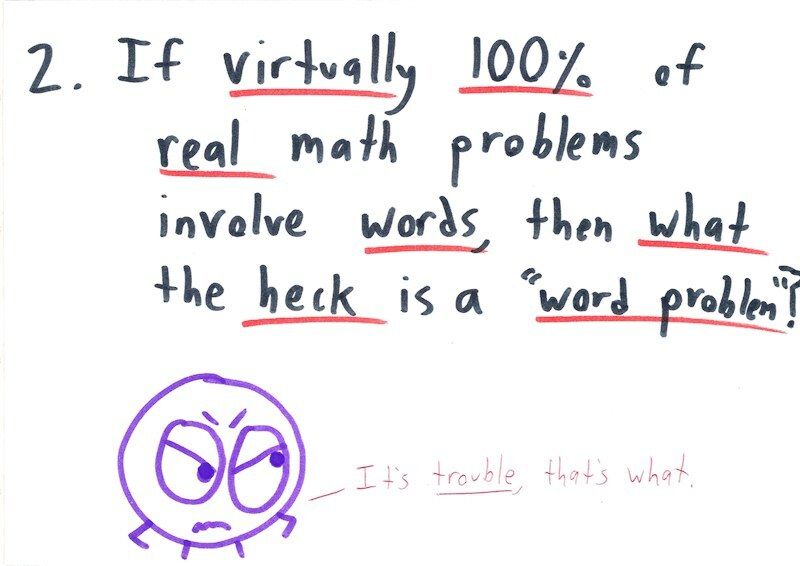 And of course math problems have words! One half of mathematics is “pure math.” It deals with abstract ideas, pursued for their own sake. It demands clear definitions and logical arguments. In short, it’s chock full of words. You don’t have trust me on this: take a look at a random research paper in pure math. There are more sentences than equations. The other half of mathematics is “applied math.” It aims to solve real-life problems, working its fingers into fields as diverse as science, finance, design, and government. If you want to communicate about the quantitative problems in these fields (let alone solve them), well, you’d better get ready to use some words. Word problems aren’t an invasive species. They’re the whole biosphere. My first year, I taught students who had come through a tough, testing-driven middle school. They had bought into a simple vision of education: school is work. To them, cranking through math problems was like hammering nails or folding laundry—not necessarily a barrel of laughs, but satisfying in a familiar, workaday way. You’ve got a task. You do it. Then it’s done. Willing to work hard? Yes; admirably. Willing to think hard? Not necessarily. I suspect many students share this rather joyless, overcast view of education. They may not love math, but at least they know what to expect. Word problems violate that contract; they interrupt the flow. 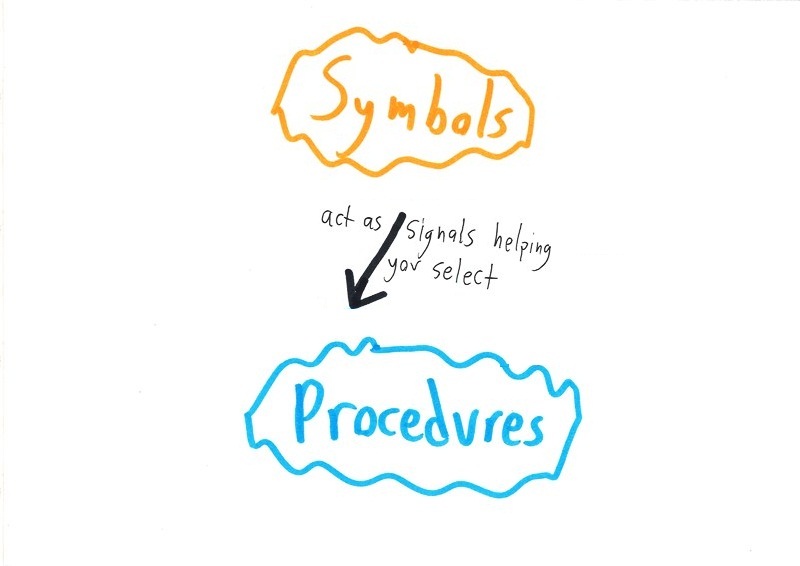 For a student like me, “doing math” means learning which symbols trigger which procedures. For example, the symbols “4 + 2x = 18” triggers the procedure “18 take away 4, then divide by 2,” giving an answer of 7. These connections between symbol and procedure are mostly arbitrary. I take away 4 because… well, because that’s what I’m supposed to do. There’s no deeper reason. 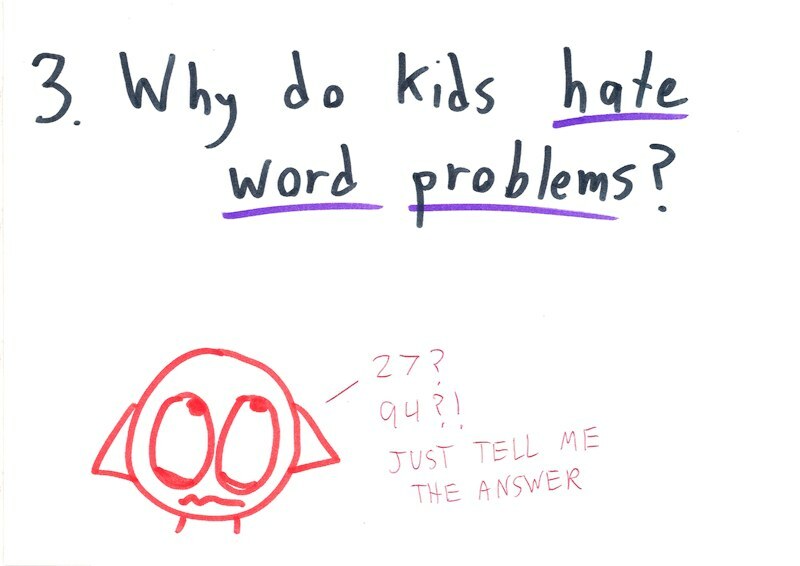 And uh-oh… here come word problems. My old triggers (the symbols “x” and “+”) are nowhere to be seen, so I don’t know which procedures to execute anymore. I need to start from scratch, learning a whole new set of cues. And even worse, these new triggers aren’t clear and unambiguous like the old ones. They’re subtle and tenuous. They’re embedded in that messy human creation called language—full as it is of paraphrase, omission, and implication. My teacher thinks that these “word problems” are a lot like the numerical ones, but to me, they’re a whole new breed. All my old knowledge feels useless in this unfamiliar verbal swamp. Is it any surprise I’d rather stick to what I know? As I wrote last week, procedural thinking is often useful (even crucial!). But it cannot replace real understanding, the kind of conceptual thinking will keep bearing fruit. Moreover, success demands connecting the two, linking concepts to procedures, ensuring always that the how is rooted in the why. Previous Post Are You a Dish-Washing Robot? I think a lot of the unhappiness with wordy questions is the lack of clarity. In most circumstances you apply maths to something you already conceptually understand. With a wordy problem you have to first conceptually understand what the person asking the question is trying to illustrate, and then apply maths. And often, those who write questions do so rather badly. I would suggest a diagramatic question; it is immediately clear what the situation is, and there is no room for completely misunderstanding what is going on. Often there are unmentioned items in a wordy question, like whether the trains are at opposite ends of a straight track, or which way they are going. 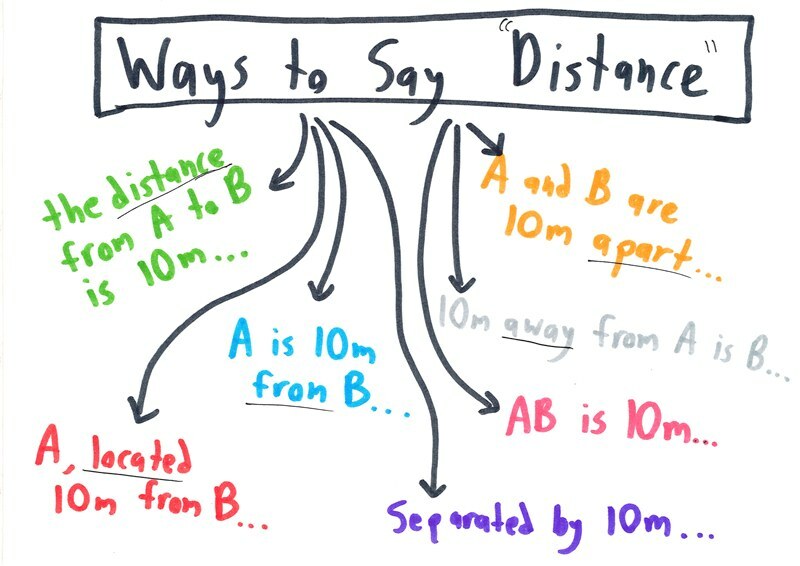 And then there’s all the verbiage to describe the quantity you need to calculate, like ‘the distance travelled by the slowest train when they pass each other’. Why make me play ‘guess the picture in my head’ before I can actually analyse the problem? Plus, since you know the picture, you’re going to be a very bad judge of whether the words describe it well. Yeah, certainly a lot of questions have some ambiguity, and a good visual often helps. Can’t argue there. Originally this post had a long middle section outlining some serious flaws in most word problems, and recommending Dan Meyer’s three-act lessons as a possible alternative. (Dan also addresses your complaint, by showing not merely a diagram, but usually a video.) But there’s so much to say that I figured it deserves a different, later post! For what it’s worth, I think diagrams sometimes go too far, effectively eliminating any need for you to read the question or understand the real scenario – you can just look at the picture. That’s not great either. 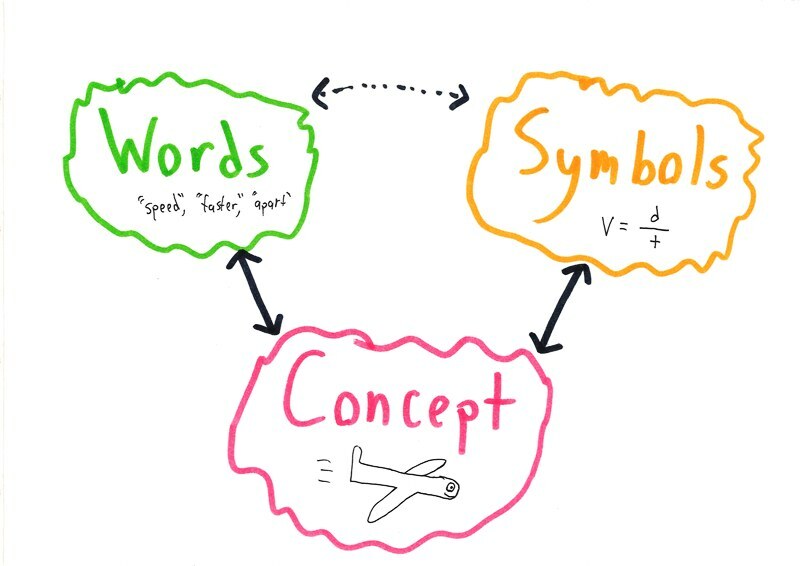 I wonder why you don’t see more half-labeled diagrams, or diagrams that show the physical relationship between the major objects without explicitly spelling out the mathematical relationship… Seems like a plausible middle ground. 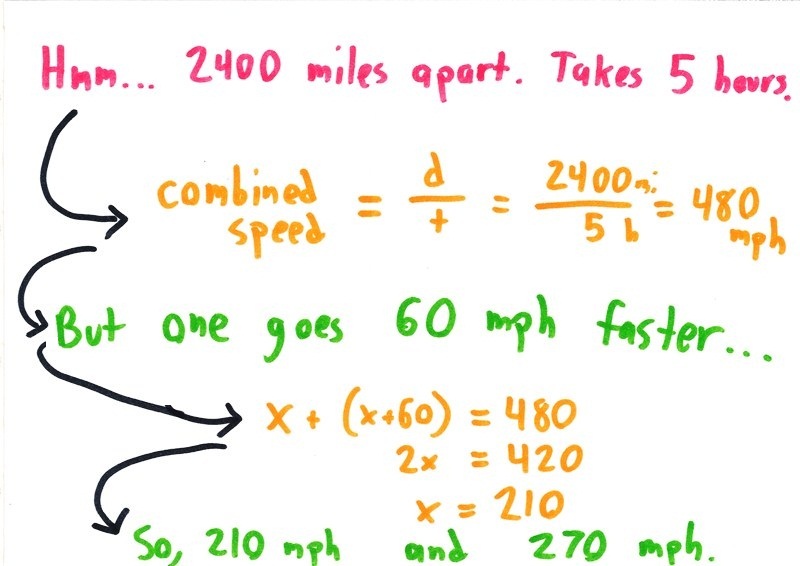 Ben, you reasoned this way: “Since it took 5 hours for the two planes to travel a combined distance of 2400 miles, it must be true that the combined speeds of the planes make 480 mph.” I personally think that this inference is really hard. To someone who has done many of these “combined distance/combined speed” problems, you have the tool in your toolkit already. But for someone who needs to invent that tool, I think it’s a tough business! My point here is that the problem you selected is, in my view, *mathematically hard,* not just word-problem-ally hard. That’s fair. If you think of it as “2400 miles were traversed over 5 hours,” I don’t think it’s so hard. But the notion of “combined speed” does open up a whole tricky set of questions about how (and whether!) speeds can be added, and I can easily imagine students getting caught on that. maybe word problems need to be practical problems first. I think that is where videos help, but also real experiments help more imo. on a younger perspective actually having to measure things gives better knowledge of measures. this could apply to things such as speed as well. if students were first grounded in a strong sense of “the real” i.e. things in front of there face, I think they might better understand how to apply the same knowledge to planes and cars. Fun stuff. I love the “bad drawings”: they manage to capture real feelings with remarkable economy. My first thought was to treat this as if it were one plane traveling over the total distance (granted, this isn’t my first rodeo-of-travel, so I “know” that I can get away with that approach. 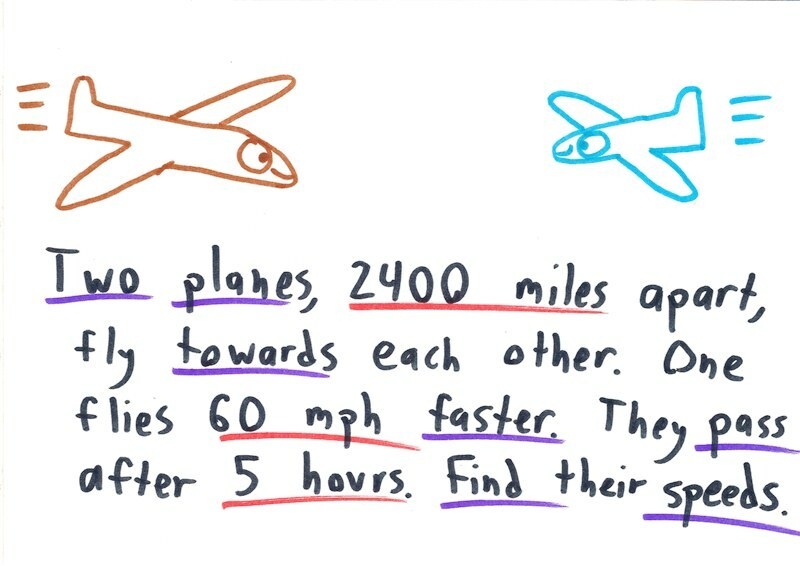 The hypothetical single plane travels at the sum of the rates of the two planes (x + (x + 60)) = 2x + 60 for 5 hours: 5(2x + 60) = 10x + 300 and covers 2400 miles. So 10x = 2100; x = 210 and x + 60 = 270. Really didn’t explicitly think in terms of formulas, intuitively waited to divide until I had 10x so that division was trivially easy, and was able to do this w/o writing anything down (always good when I don’t have paper handy). I always prefer mental math when it’s possible and relatively easy. Great post, btw. Have seen this problem far too much, even in my teaching at the university and MBA level. Also brought to mind a great TED talk by Conrad Wolfram that touches on many of these same points. Thought the assembled masses here might be interested, if they hadn’t seen it already. I loved this line, and I think it sums up why a lot of people think traditional math classes are just fine. Which is why I’m posting this comment before I even finish reading the post. I found your blog last year, then kind of drifted away. As I’m getting ready to use your probability stories (thanks for that outstanding work) I was reminded that I should come back and see what’s new. Keep up the great posts. It occurs to me that this dichotomy quite possibly contributes to the difficulty many students have in understanding why we do math at all. If all you learn about are symbols and procedures, then you will never believe teachers when they say that someday you will find this stuff useful. I wonder if kids see this kind of math more like learning a video game about fighting cylons–some find it great fun, but nobody finds it relevant to what grown ups do. If math in the early stages is woven into daily life kids have a better chance of learning how it fits in. Would this work: take the little kids out on the playground and have two kids *be* the planes. They can run towards each other and the class can figure out when or where along the line they will pass by? That brings it down to the fun level of their own lives. Then as they get older, keep the problem solving on the concrete level but make it more relevant — cooking, building, sewing, data analysis, sales, etc etc. Eventually, the problems can become complex enough to convey the abstract ideas as well as producing answers to relevant questions. 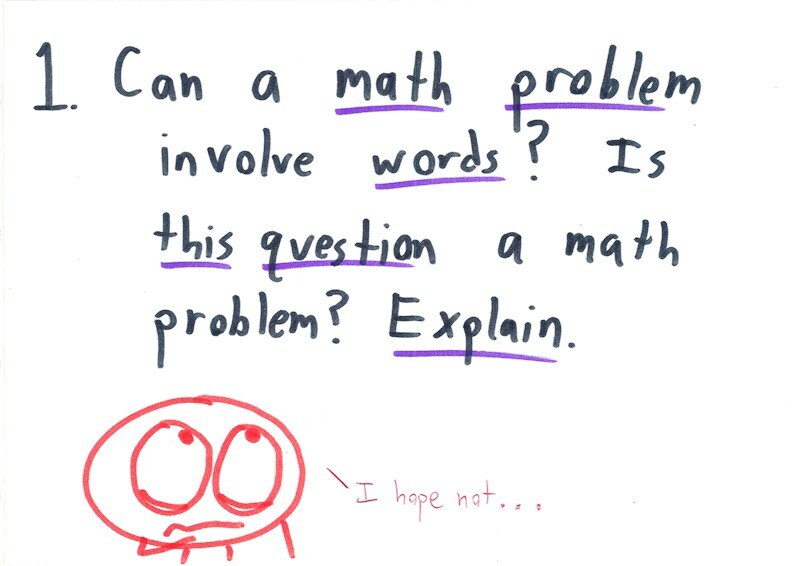 If only we started off with problems, and let common sense have a go, before developing the formal mathematical approach, then we wouldn’t have “word problems”. The present situation is that the students see the word problem as a disguised piece of arithmetic, and tend to dive in, grabbing numbers, guessing which procedures might work, and bingo! the answer. The case for a more formal approach can then be made on the basis of a) the numbers in this problem look horrible, and b) we might want to do the same thing over and over again, leading to the idea of a formula. Reblogged this on as time goes by. For what it’s worth, I actually enjoy washing dishes, the process not just the result. This is doubtless helped by the fact that I have a very long spine and can wash them while sitting down. and a most amazing recurrence involving e.
To make matters worse, there are curriculums now teaching young kids to look for the words that equal math signs, so you have first graders earnestly circling “more” because “more means add” and likewise. It took me a year to break my niece of the habit of seeing the word “more” and automatically adding the first two numbers she saw, even if it made no sense in the context of the problem. I found this today, and remembered your airplane problem. 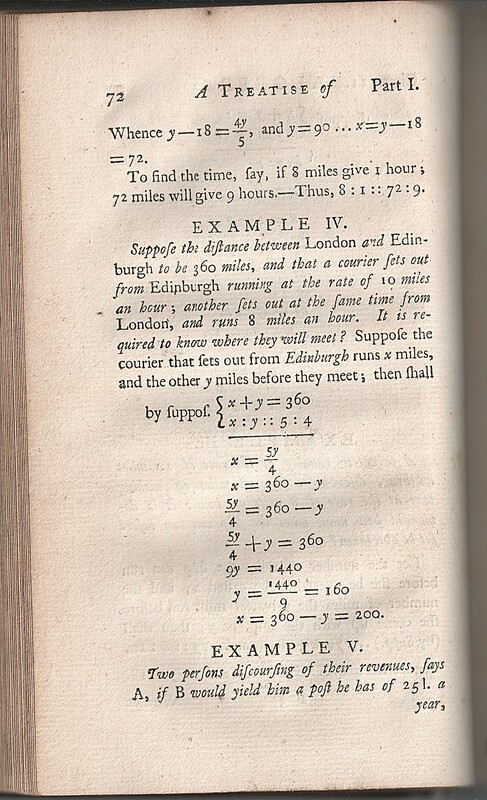 It is from Colin Maclaurin’s “Treatise on Algebra”, from some time around 1720-1730. Nothing changes ! additionally i find that a major issue stumbling students is the tendency to compartmentalise learning. in other words, something they learn in english they cannot apply in history… etc. In my mothertongue, I have always been good at “word problems”. In English, it is much more difficult. Yes, it is definitely a language problem. I think, searching for clues as ‘more’ is not necessarily evil, but always has to be done in a language context, to ‘translate’ the problem for themselves, draw a picture, doodle, and so on. And the teacher could translate the problem to any foreign language to check if it makes sense. When I reflect on my own days in high school, I was far more comfortable with math than nearly all my classmates (though my grades were not always very good). I sympathized with the frustrations that my friends had when they explained, “I’m good at math, but I’m just not good at word problems.” I simply attributed (at the time) my abilities to having somehow “figured out” word problems. After all these years, I think I finally understand, and all respect for you aside, Ben, I think you missed the mark here. My diagnosis: students are not taught how to solve real-world problems using mathematics, they are taught how to memorize a set of ever-growing yet disconnected algorithms, and are told that the process of following these algorithms is “math”. Worse yet, it was only a few physics and chemistry teachers (and one comp sci dude) who ever tried to to help me (personally) learn any problem-solving tools beyond memorization of algorithms. Thus what most people think of today as “real math”, is just a combination of arithmetic and low-level algebra. Your two categories of applied math and pure math bear no resemblance to “real math” because they don’t look like “real math” at all. To such students, applied math looks like a bunch of physics and chemistry problems (rocket science!) and pure math (and geometry) feels like a weird and incomprehensible branch of logic & philosophy. “Real math” is what a four-function calculator or abacus does; it’s a process that we long ago invented machines to help out with. Math teachers drop the ball by not ever trying to explain what you touched on (but never said plainly): word problems are the entire purpose of math. Yet, as I’ve noted, math teachers don’t actually teach or say this. They dance around with all sort of conceptual talk, they teach steps of algorithms, they even provide helpful ways to remember these algorithms. But I can count on one hand the occasions where a math teacher ever brought the point home that all these algorithms are really ways to decode and unlock a world of mystical connections that invisibly exist all around us. Pythagoras wasn’t a mathematician, he was a musician who lead a cult of numerologists who painstakingly found a bunch of quantifiable relationships everywhere they looked. Euclid was trying to demonstrate universal principles behind workaday tasks like building a straight wall. Egyptian society was bitterly divided about the cosmological meaning of fractions and what they meant and would recognize the confusion in a child who doesn’t yet understand why one-half is rounded up not down (and don’t get me started on significant figures). Students know math is hard and are OK with that. But they are fundamentally misled by math teachers who fail tell their students that “real math” isn’t math, it’s just a set of rules people came up with, and that these rules are very useful and can be combined in all sorts of cool ways to make sense of complicated (and otherwise scary) stuff around us. I think students struggle with “word problems” like the one you describe because these are really physics problems! The “math” is secondary to the physics in this case. Sure, you might teach them that “d=vt”, but setting up the problem (the physics) is the hardest part of this problem. Once you have the correct setup, solving for the velocities is trivial. All (most) physics problems are “word problems” like this. One needs “physical intuition” to set up these problems, which one learns in physics class, not algebra class. Absolutely mathematical symbols trigger a procedure, but to a physicist, these words also trigger a procedure. 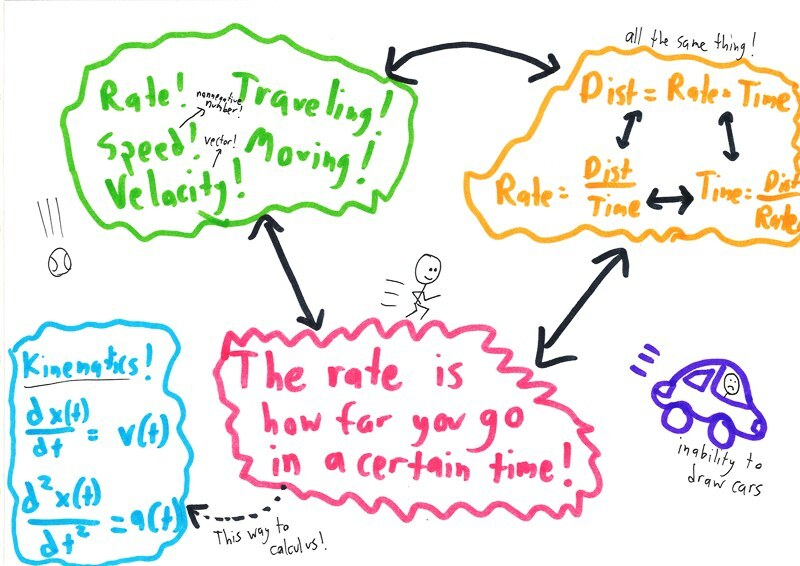 Words like “traveling” and “constant velocity” immediately tells me kinematics and I can write down the equations to solve the problem, since I am trained in physics. What is interesting tho, is the opposite case. What if one is trained in physics but not math (totally possible!). They could set up the problem, but would have no idea how to solve it! Weird!